Tom and Tamara Conry stand outside their home in Paradise, which was almost untouched by November's deadly Camp Fire. A property insurer recently notified them that would not renew their policy past January. Not all homes in Paradise were destroyed by November’s deadly Camp Fire. Approximately 10 percent of buildings in the town of Paradise are still standing, according to a rough estimate from the California Department of Forestry and Fire Protection. But families who still have their houses in the area, and who may be considering returning, could have trouble keeping their home insured, at least at an affordable rate. 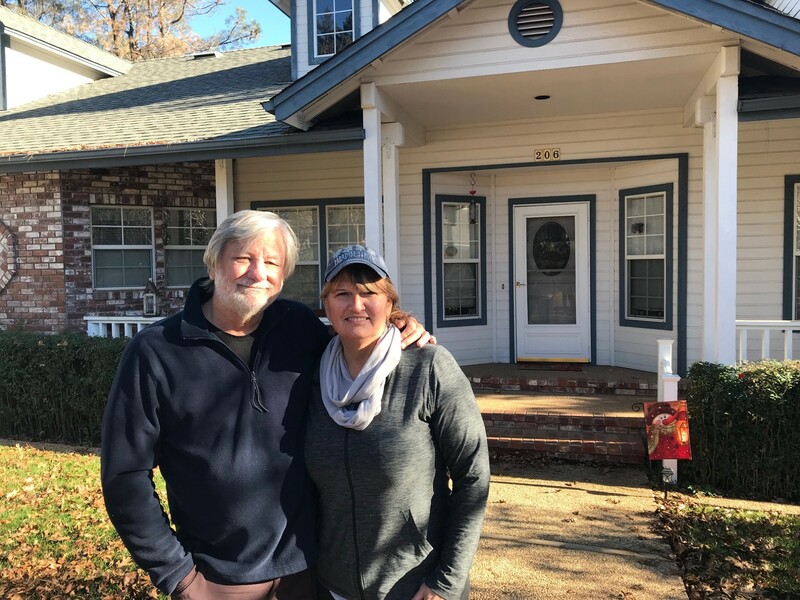 One property insurer, American Reliable, has already decided not to renew coverage for Tamara and Tom Conry, whose Paradise home was barely touched by the Camp Fire. “Getting that letter was like a slap in the face,” Tamara Conry said about receiving the non-renewal notice in December. She is now living in a Yuba City rental apartment with Tom, her husband, because her home is still contaminated by smoke, and her utilities were only restored recently. The Conrys say their homeowners insurer had been good to them up until the nonrenewal. American Reliable paid for their hotel after they evacuated, and is now paying for their temporary rental. The Conrys are also working with the company to remedy ash and smoke contamination inside their home. And the couple filed a claim for their back deck, which was scorched. But the news that American Reliable wasn’t renewing their homeowner’s insurance after January has just added to the headache of making their home livable again, the Conrys say. At least two other insurers have already turned them down, and they’re now working with their second broker to secure new coverage. “Sometimes I feel like it would have been easier if the house had burned down,” Tamara said. Tom and Tamara Conry are not the only ones with this problem. The California Department of Insurance says they’ve heard from others in fire areas who have faced a non-renewal from a property insurer. And Amy Bach, executive director of consumer advocacy group United Policyholders, says she’s been helping homeowners in fire areas who were non-renewed for properties that are still standing. “Their situation can almost be worse than those whose homes that are gone,” Bach said about those homeowners. “They’re sort of competing with the total loss victims for attention and dollars, but they also don’t have the same protection that the total loss people have to keep their insurance,” she added. Recently revised California law ensures people whose homes burned down can renew a homeowners policy for up to two years. As of this month, California guarantees people with a home that’s partially damaged or has no damage in a wildfire area can keep their same insurance policy for at least a year. But since the Camp Fire happened last year, that law doesn’t help the Conrys. As a state Senator in 2018, Insurance Commissioner Ricardo Lara pushed through that new law that ensures at least one year of continued coverage for homeowners with property standing in fire zones. “A sudden non-renewal can shatter survivors’ feeling of security that they have barely started to rebuild,” Lara wrote. His office said homeowners in fire zones who were non-renewed last year can still contact the California Department of Insurance, and their office will review their case. A spokesperson with American Reliable Insurance Company, and its parent company, Global Indemnity, didn’t respond to CapRadio’s’s emails and phone calls asking to discuss the Conry’s situation. Mark Sektnan, president with the Property Casualty Insurers Association of America, says companies are always reassessing their risks. “You want to make sure you don’t have too many policies concentrated in particular areas because if there is a loss, it could have negative implications for the company,” Sektnan said. But Sektnan says there are about 50 homeowner insurers in California, and one is certain to cover the Conrys. The family will likely pay more for their coverage, though. “If you live in a high fire area, one should expect that one’s insurance should be more. And that’s to ensure that people in the high-risk areas should pay a higher amount of insurance than people who live in low-risk areas. Otherwise, people like where I live would end up subsidizing these people,” Sektnan said. California law has set up a property insurer of last resort, which the Conrys decided to go with. But they will pay double what they do now. The couple may not be stuck paying more for long, however: They’ve recently decided to leave the devastation of Paradise, and will put their house on the market in the coming weeks. (AP) — Insurance claims from California's deadly November 2018 wildfires have topped $11.4 billion, making the series of fires one of the most expensive in state history, officials said Monday.